At the heart of the compressor package, is the compressor itself; and its most important characteristic: the flow/ pressure control. 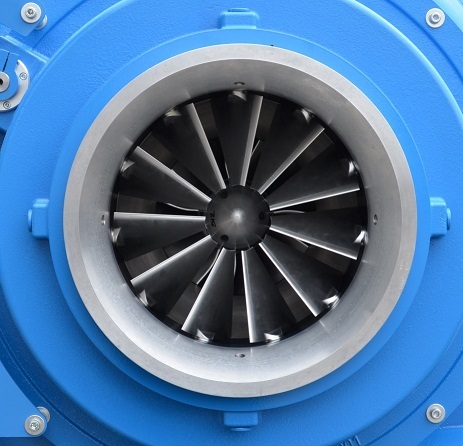 Integrally geared centrifugal turbo-compressors with the proven 2-point regulation is the most efficient aeration equipment available on the market. The product range features standard auxiliary components, which can be sourced locally and avoids special, high frequency electronic components. 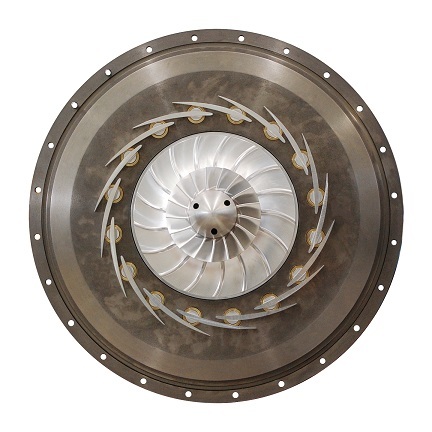 This control mechanism is a 1-point control, regulating the airflow with mechanical outlet diffuser vanes ,changing the relative airflow vector and therefore relative air- speed with limited influence to the required pressure line. Effectively moving the compressor performance curve along the horizontal axis. No efficiency compensations for fluctuations in pressure and air characteristics (temperature, relative humidity) are provided. To add this control feature, refer to the 2-point-control mechanism below. Featuring the mechanical outlet diffuser blades, but extending the control range with its electrical 2-point control. A standard low frequency VFD is adjusting the speed within a limited bandwidth to adjust the compressor operation to pressure/ air quality fluctuations (e.g. temperature, relative humidity). Please note: the VFD is not used, as in regular 1-point speed controls, to regulate the airflow; it is a fine-tunding mechanism. The airflow regulation is handled by the outlet diffuser vane system. Featuring the same 2-point mechanism as above, but utilizing two mechanical systems: the outlet diffuser vanes in combination with inlet guide vanes. The inlet guide system also adjusts for changes in pressure and air quality (e.g. temperature, relative humidity) by changing the pre-rotational angle of the inlet air flow. This is handled with contant speed. Compare the relative efficiency map to the right to see the differences. Diagrams: The dark blue lines represent relative efficiency lines; dashed black lines are the compressor curves as different diffuser positions. The control of the flow/ pressure turndown of a compressor is at the heart of every OPEX evaluation. The off-design operating points are the conditions in which the compressor runs most of his life. A compressor control can be more than just regulating the speed. The geometry and dimensions of the impeller define the compressor curve (see above dashed lines in diagram) and influences its absolute design efficiency. 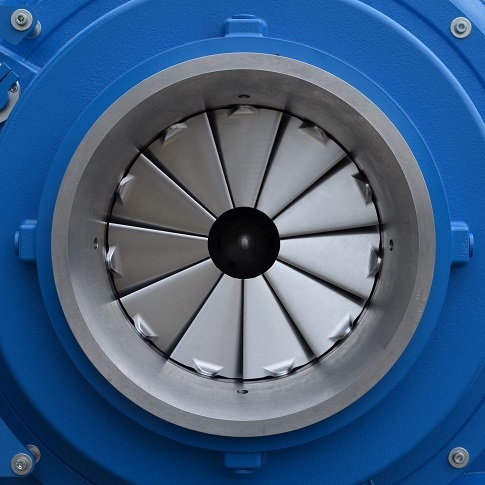 The impeller utilized is designed for the specific requirements and specifically suited for discharge diffuser vane operation (1-point and 2-point vane regulation control). 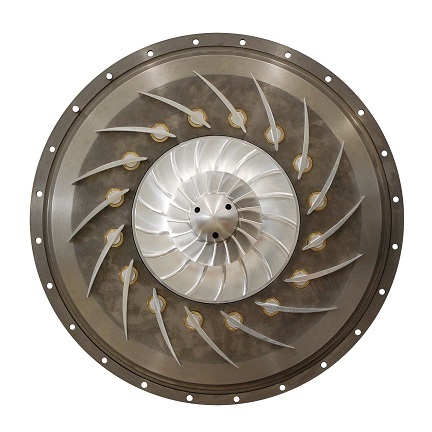 The impeller is milled out of a solid block of high strength aluminimum alloy and slightly backleaning for increased efficiency.